Great tension building. Unpredictable plot. very talktative for a body horror film. not tarantino's finest - but I liked it. Tarantino's re-creation of violent exploitation cinema with girl power. Zoë Bell is ace. One of my favourites. Action mixed with a good plot and better script. All types of good stuff is happening in this cult film and I like it. Gritty. Classic Tarantino style dialogue. Action, not terrifying. 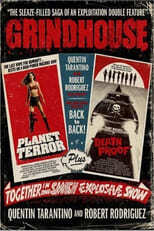 My least favorite Tarantino film but still a great nostalgic throwback to 70s grindhouse. Classic Tarantino: great shots, phenomenal dialogue. Underrated.